Mr. Michel is newly elected to the District 3 seat on the Terrebonne Parish Council. Although new to the council, he brings a diverse background that includes insurance, managed health care, medical sales and management, business, and education. Mr. Michel is currently managing two pharmacies. He balances this responsibility with striving to help those who are less fortunate. From helping the elderly understand their Medicare benefits to guiding students toward becoming productive members of society, Mr. Michel has always found himself employed where he can help others. 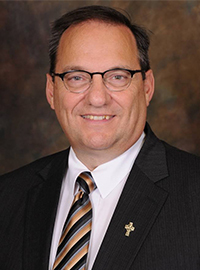 As a member of the Board of Directors for World of Hope and a member of the St. Bernadette Catholic Church and Pastoral Council, he has reached out to members of his community and to those in need in the Philippines to help bring food, clothing, shelter, education, and an enhanced sense of spirituality to others. Mr. Michel’s goal as he represents residents of Broadmoor, Oakshire, Southern Estates, and other areas of Bayou Cane is to be instrumental in continuing the works that have already begun with drainage improvement, protection of our wetlands and coasts, and maintaining open communication with residents of District 3 in order to work with them toward becoming the best we can be in Terrebonne Parish.